In "Buried Truths," a new six-episode podcast, Pulitzer Prize-winning author and journalist Hank Klibanoff explores the case of Isaiah Nixon, an African American man killed for voting in Georgia in 1948. Photo courtesy WABE. Editor's note: This article contains information that was reported by Emory Report and other media at the time, but will not be discussed until later episodes of the podcast. A recent Emory College graduate was working as freelance producer at WABE Radio when she told a colleague about a wonderful course she had taken at Emory that was still on her mind: Georgia Civil Rights Cold Cases Project, taught by Pulitzer Prize-winning author and journalist Hank Klibanoff. An idea sparked by that conversation has now grown into "Buried Truths," a new podcast series featuring Klibanoff and the project's work. The class, which began in 2011, allows students to take an in-depth look at racially motivated murders that went unpunished in the Jim Crow South. It mixes journalism with history and African American studies, and has been featured in the Wall Street Journal and Atlanta Magazine. In fall 2015, students took a deep dive on the case of Isaiah Nixon, a 28-year-old farmer and father of six who dared to vote in Georgia’s Democratic Party primary in 1948, just two years after the U.S. Supreme court ruled Georgia’s all-white primaries unconstitutional. Then they shot him three times, one of them a fatal bullet to his abdomen. The brothers would be arrested, only to later be acquitted by an all-white jury. 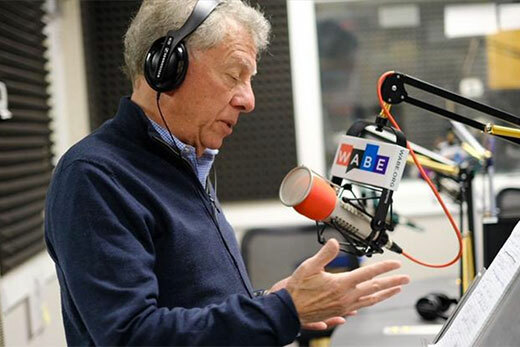 Klibanoff, who won the Pulitzer Prize in 2007 for his book, “The Race Beat: The Press, the Civil Rights Struggle, and the Awakening of a Nation,” talks at length and in-depth about this important cold case in “Buried Truths,” a six-episode podcast produced by WABE Radio that began airing March 26. "At that time in our history, an act of voting was an act of protest," says Klibanoff. "It was a right that was deprived him, and he paid the price for voting, and that is something I think we are all resolved to never let happen again." With “Buried Truths,” Klibanoff set out to explore the tragic death of Isaiah Nixon and also the South at a pivotal time in history. The podcast tells a story about elections, voting rights, intimidation, courage and violence that is as relevant today as it was 70 years ago. It chronicles the sacrifices black citizens in rural Georgia made to exercise their right, and the lengths that others — including those in power and those who lived down the street — would go to suppress it. Georgia’s track-record of equal treatment for African Americans under the criminal justice system is murky at best. There was, in the case of the Johnson brothers, the “absolutely slam-dunk reliability in Georgia and throughout the South, to use the self-defense alibi whenever there was a white man was accused of killing a black man,” says Klibanoff. In court, the brothers claimed they were at Nixon’s house that day merely to hire him for a job, only to end up having to shoot him in self-defense. Despite the fact that the white sheriff even said the brothers were there to kill Nixon for voting, an all-white jury let one walk, then charges against the other were dropped. The Nixon family — including Dorothy Nixon Williams, who was six-years-old when she watched her father’s murder — fled Georgia for Florida not long after the killing. Williams, now 76, would grow up to marry and have children and become a psychiatric nurse. These families struggled, but as Klibanoff’s story will show, against all odds they came out the other side. After the family left Georgia, Isaiah Nixon’s grave was lost to a past of injustice. In 2015, three students from Emory’s Georgia Civil Rights Cold Cases Project, along with Klibanoff, found Nixon’s final resting place. “Buried Truths” is a six-episode opportunity to connect with people outside of the walls of the classroom and allow them access to what Klibanoff’s students have — the chance to revisit Georgia’s sordid racial and judicial past and see all of the white men and women in the pages of history who sat on the sidelines, watching it all happen and doing nothing. The first episode of “Buried Truths” debuted on March 26 and new episodes will be released on Mondays. You can listen here and subscribe using your favorite podcast app.